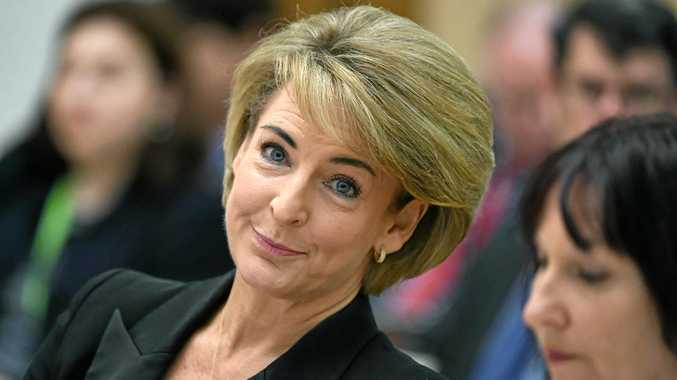 LIBERAL Senator Michaelia Cash went way too far this week slurring every woman who works for Bill Shorten, but the media overstepped the mark too in its pursuit of the minister. Cash should have said sorry for her slur, and the Prime Minister failed to put out the fire by not making her apologise for what she said. This guaranteed the media frenzy went on for another day. On Thursday things turned into true farce with Parliament House security guards using a whiteboard to block camera views of the minister walking into a room already filled with cameras for her next appearance before senate estimates. Parliament has a bunch of strange rules about where cameras can and can't film. This is done so people can move freely about the building without being afraid there is a surprise press conference around every corner. But the media went too far when one TV station had its cameras locked on the minister's mobile phone as she was texting her staff about how best to leave the building. The footage was trumpeted on the 6pm news as an exclusive and stills of her phone were fodder for the haters on social media. As much as I like to smash politicians for what they do and what they say, their phones are private. Her texts were not of national interest, they were gotcha gossip. Cash deserves everything she got for her slur, but no-one deserves that level of intrusion. WHEN Michael McCormack became Deputy Prime Minister this week it triggered a minor reshuffle of ministers' jobs. He takes on transport while other Nationals were moved around in and out of ministry jobs. Some to reward political favours, others performance. But with McCormack's elevation to cabinet came the appointment of Darren Chester as the new Veterans Affairs Minister. That's the fifth person to have the job in less than five years. No wonder veterans feel ignored by Canberra when it is considered a minor job and so many people have chopped and changed at the top of a disgracefully dysfunctional veterans affairs system. Why would public servants believe promises of any minister to change the department and the hoops they make veterans jump through when there is a new broom every few months? Darren Chester is an ambitions politician, but I plead with him to focus his energy on fixing the mess at the DVA, then work on getting a promotion. As I have written in recent weeks, 400 current and former members of the ADF have taken their own lives since 2001. That's eight times more than the people we lost in Iraq and Afghanistan, combined. I WAS in Tasmania this week and a plan to ban pokies from pubs and clubs is one of the central issues of this weekend's election. Labor want to do it, the Liberals don't. The debate about poker machines is one of the most misleading in current politics. Most of the people who write about it don't play them and swallow anything anti-pokies groups will feed them about their evils. Yes, there are problem gamblers, but it's only a very small fraction. In fact, in Tasmania, charity Anglicare says there are just 2000 problem gamblers in the whole state of more than half a million people. That's less than half of one per cent of people. Banning all pokies from pubs and clubs is a needlessly brutal solution to a small minority problem. Let's just make sure there is help for people who have a real problem. Paul Murray is a broadcaster on Sky News who can be seen on Paul Murray LIVE weeknights 9-11pm AEDT.